Main Street & Kindergarten Center is focusing on GRATITUDE as our November Character Trait. This goes well with the tradition of Thanksgiving & also the respect for Veterans’ Day. We will model Gratitude & explicitly teach while reinforcing w/ a focus. Ironically, we express Gratitude for students showcasing Gratitude for peers and others. 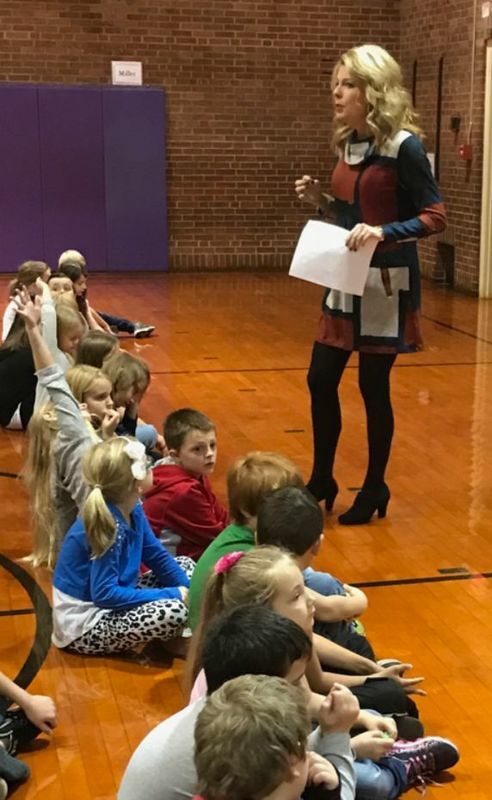 To “kick-off” this Character Trait focus, Shelbyville Alumni, local Community Member & Parent, Rachel Reed, spoke to all (K-3) students on Monday, November 6th in grade level rotations. This is an important message for our students to understand the power of gratitude as returning kindness w/ a positive attitude. We discuss and practice w/ the students expressing gratitude. Gratitude is most effective when it is specific & timely. This means that commenting on a peer’s lunchbox does not have the effect that “I thought we made a good team during math groups today; Thank You.” does. We also discuss the phenomena that there are multiple “Languages of Appreciation” based on a book by Dr. Gary Chapman. We change the terms to be more student-friendly but “Words of Affirmation” are specific praises that encourage others & let them know they are valued. They can be private or public. The words may be typed such as an email but a hand-written letter is more personal. A Hallmark card might have a great message but the personal note in the card is impactful. “Acts of Service” is when we do things for others such as emptying the dishwasher just so your parents do not have to. “Tangible Gifts” is when you provide home-made, sentimental, or monetary items. “Quality Time” is when you just purposefully make time to spend with someone or even just giving them focused attention. “Physical Touch” can be appropriate when it is something like a high-five or a fist-bump or meaningful handshake. These show appreciation and add to the camaraderie.